According to reports, a 14-year-old boy is listed in critical condition at a local hospital. At that point, Mecalf yelled to his son to run as fast as he could. According to CNN, the suspect was asking people if they were Jewish and then shot them. 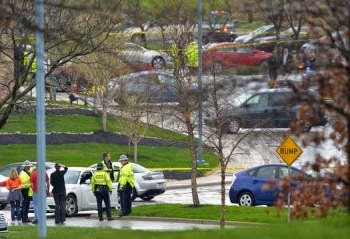 Three people are dead following multiple shootings reported at the Jewish Community Center and Village Shalom in Overland Park, Kansas, KSBH reports. Overland Park Police confirmed multiple shots were fired at the center and Village Shalom, a retirement home. One man was taken into custody by police at Valley Park Elementary school. The suspect was heard yelling “Heil Hitler” while taken into custody.